In the Display tab of the Map View, click Show Contours to open the Contours section and display the contours on the map. Contour Numbers — Select this check box to display the contour values. Type the font size for the contour values or click the up/down arrow to increase/decrease the font size. Horizon — Select the horizon on which the contours will be displayed. Note: 2D horizons cannot be contoured. To do that, regrid and interpolate the horizon to create a surface (see Regrid and Interpolate/Extrapolate), and then display contours for that. Property — Select the horizon property that will be contoured. The latest Insight version allows you to display the contours in TVDSS (ft). To do this, select TVDSS (ft) here. Value — Type the starting benchmark value of the contour for the lowest point on the structure. For example, if you enter a value of "5", and the lowest point on the structure is 3,500, you will see the lowest contour displayed at 3,505 on the map, followed by the next contour at the specified interval. Interval — Type the interval value between contours. If you wish to display only ONE contour value, type the desired Value and set the Interval to 0. Highlight — Type a contour value which you want to highlight on the map. You can also enter multiple values separated by comma (i.e. 1000, 1200, 1400), and/or a sequence of numbers in a min-max[step] format (i.e. 2700.0–2800.0[10.0]). For example: 1100, 1275, 1300–1400 will highlight the contours for five separate values. 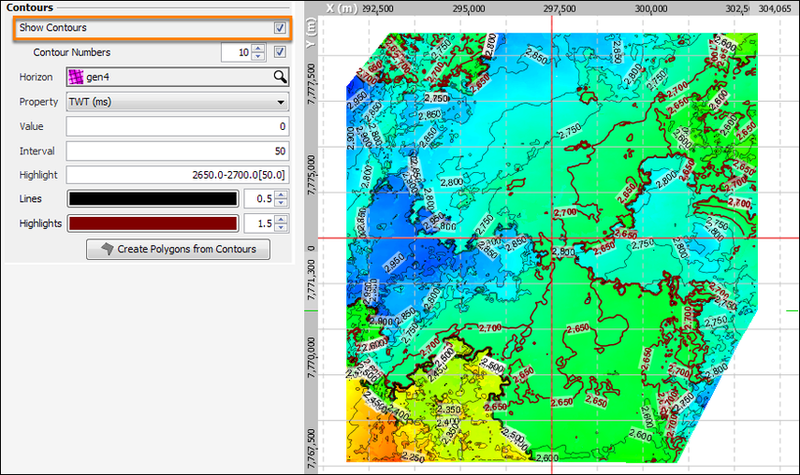 Highlighted contour values that are different from the contours captured by the Interval will be added to the Map View. Lines — Click the colour box to select a colour for the contours. Type the line thickness for the contours or click the up/down arrow to increase/decrease the contour line thickness. Highlights — Click the colour box to select a colour to highlight the contours defined in the Highlight box. Type the line thickness or click the up/down arrow to increase/decrease the line thickness of the highlighted contour. Create Polygons from Contours — Generate polygon objects for each horizon contour value that has closed contour shapes (see Creating Polygons from Contours). To combine the display of contours with amplitude extraction, see Contours Based on Amplitude Extraction.